On a British Airways flight from London to Delhi, each of the passengers has a vivid dream. In this dream they see the person they want to be, the ideal them. When the plane lands, the passengers discover that the dreams were a precursor to reality – they have each been endowed with “powers”. As realisation dawns, factions form and individuals begin to disappear under suspicious circumstances, it becomes clear that the world as we know it is about to come to a very violent end. Aman Sen and the motley crew he has assembled must pool their resources in order to stop the ambitious and cruel Jai Mathur. At first glance, Samit Basu’s fifth novel (the first to receive wide release outside his native India) seems to be your average superhero adventure. With elements of Marvel’s Fantastic Four and X-Men, it introduces us to a cast of characters who have received a mysterious gift from an unknown benefactor, and who have a difficult choice to make: to use the gifts they have been given for their own good, or for the good of mankind. But there’s a depth here, an examination of issues that sometimes get ignored or glossed over in the traditional superhero outlets (which is often down to the medium, rather than the writing). The distribution of powers – based on the subject’s dreams – leads to a very obvious split: on the one side, Jai Mathur and his “team” have the strength, the speed, the ability to fly, and with those powers seems to come the desire to take control, to subjugate the Earth’s population. On the other, the B-list superheroes, as Aman Sen so blithely puts it: here we have Sen himself, who now has the ability to connect to any networked device – make a phone call, surf the Internet – without the need of a phone or a computer; Tia, who has the ability to create multiple copies of herself; Uzma, whom everyone loves immediately. The powers here come without the megalomania, and so we find Aman Sen trying to work out how to use his powers for the good of humanity. And then there are rogue elements who fit on neither side, and a handful of characters who remain undecided as to which side of the fence to land. Despite the inequality between the two sides, in terms of strength at least, clashes are inevitable, and Basu ensures an action-packed read through a handful of violence-filled set pieces and enough surprises to keep the reader turning the pages long after that “one last chapter before bed”. But it’s not all punch-ups and fireballs. Basu spends time examining the political and social implications that come with the birth of a new race of metahumans: should there be new laws to govern them and the use of their powers? How should the question of patriotism be handled: should these new supermen and –women be ambassadors for India, or for the world (the fact that one of Sen’s teammates is a British Pakistani adds a whole new dimension to this question)? There is plenty of food for thought here: the Indian setting presents something of a culture shift for the average superhero fan, while Basu spends some time considering the consequences of these peoples’ actions – even the good deeds have unforeseen results and domino effects that leave these “heroes” questioning their right to interfere. Don’t worry, though – there’s plenty of action to keep the story moving at a lightning fast pace, and a strong enough cast of characters to carry the story. In Aman Sen we have a wisecracking, self-confident nerd whose sole aim is to use his newfound powers for good. His polar opposite, the military’s Jai Mathur is everything that a master supervillain should be – conscienceless, ambitious and uncompromising. Between them, the four hundred other passengers of that fated flight, each with their own unique (and sometimes completely useless) power, and each with a decision to make, and a personality to justify the path they take. It’s a cast that Stan Lee would be proud of, though Turbulence is definitely more Watchmen than Avengers. 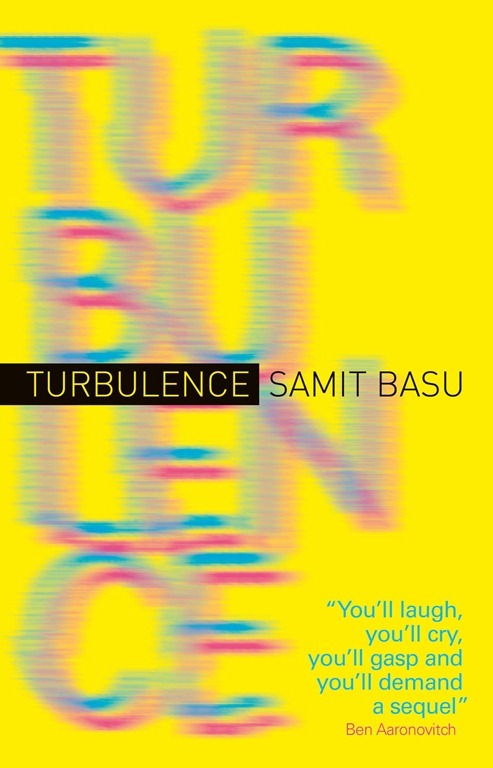 Credited as the creator of Indian English fantasy, Samit Basu arrives in the UK as an accomplished, some might say veteran, writer – Turbulence is his fifth novel, making him the best fantasy writer you’ve never heard of. That’s a state of affairs that you should rectify with all possible haste. Turbulence is a superhero novel like none you’ve seen before. A polished storyline, engaging characters and razor sharp wit combine to make this a must-read for everyone that has ever enjoyed a comic. It’s funny and action-packed, yes, but it’s also extremely intelligent and thought-provoking. It’s a perfect introduction to an excellent writer, and we can only hope that his back catalogue is made available in the UK in short order. It’s also an excellent start to a series that looks set to redefine the superhero genre for the twenty-first century. Kudos to Titan Books to bringing this excellent author, and this exciting series, to a much wider audience.